Tesla is moving incredibly fast getting its massive battery factory built, and plans to have batteries made there as early as 2016 for its Model S and Model X cars. Showing off how much has already been built at the site, Tesla investor Steve Jurvetson of Draper Fisher Jurvetson snapped these photos on a recent tour of Tesla’s massive battery factory, which is under construction outside of Reno, Nevada. While there have been other photos taken recently of the outer structure of the site, these are the first available that show images inside the construction, as well as the factory’s sheer scale. 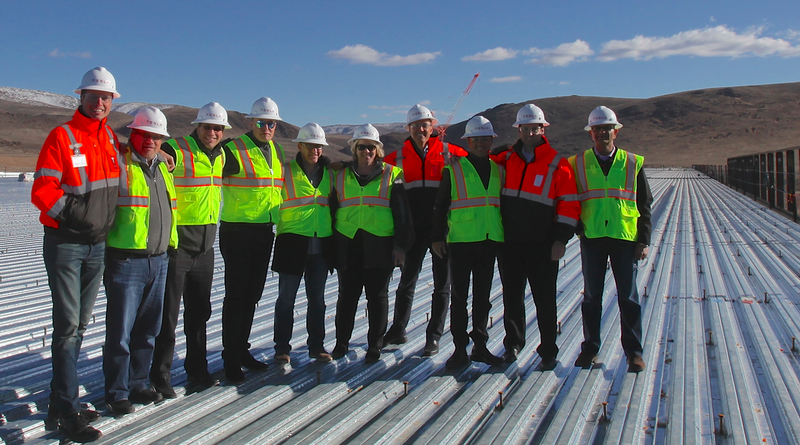 Tesla investors and execs standing on the roof of the battery factory. 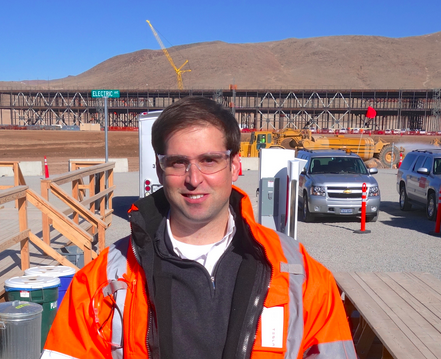 Tesla CTO JB Straubel is a core member of the founding team at Tesla, and is the project lead on the battery factory (pictured close up below). Tesla needs the so-called “gigafactory” to reduce the costs of its batteries by 30 percent for its third-generation car, the Model 3, which is supposed to be significantly less expensive than the Model S and the X. The Model 3 is targeted to launch in 2017 and the gigafactory is supposed to be able to reach large-scale production of batteries by 2020. Tesla wants the factory to produce 35 gigawatt hours per year worth of battery cells by 2020, and battery pack output would be 50 gigawatt hours per year. That amount of output would more than double the current entire world’s lithium ion battery production. Tesla is also using the battery factory to push aggressively into the power grid energy storage market. Musk said on a recent earnings call that Tesla has already been “bidding on a lot of RFPs [requests for proposals]” for utilities looking to build energy storage projects. Tesla also plans to unveil a “Tesla home battery,” or “consumer battery,” in the next month or two. That battery — likely an iteration of the one it’s been trialing with customers already — will be for use in people’s houses or businesses, Musk said. From Google’s maps, I see Teslaâ€™s massive battery factory is in remote location, about 18 miles away from Reno. If Tesla going to hire 6000 employees, where’re these people going to live? If someone is living close to Teslaâ€™s massive battery factory, can you please give more information on the apartment/housing close to Tesla’s factory? Thank you very much in advance. If they are building where are the workers and material? Just in… leftist one-sided cheerleading for greentech kills GigaOm. Fools cheer for wars and superstition. all your batteries are belong to us!